When forming an LLC, it is important to know how you will be taxed. In this guide, we will define the basics of partnership taxation for an LLC. Multi-member LLCs that are taxed as partnerships do not file or pay taxes as the LLC. Instead, the profits and losses are the responsibility of each partner. Each partner will pay taxes on their share of the profits and losses by filling out Schedule E (Form 1040) and attaching it to their personal tax return. How ownership is divided within the LLC should be outlined in your operating agreement. The formal term often used for LLC ownership is "distributive share," also known as an LLC unit. 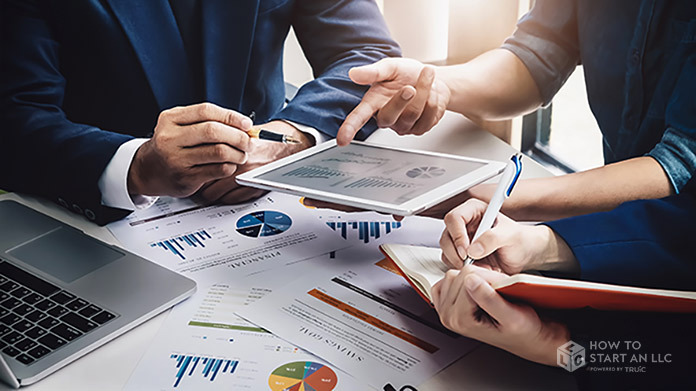 Partners' distributive shares are typically determined in proportion to their initial investment, or based on their level of ongoing involvement with the day-to-day activities of the business. Jonny, Brittany, and Laura want to start a coffee business. They all agree to split their distributive share of profits or losses in thirds since they are equally splitting all the startup costs, daily operations, and so on. Brandon and Savannah want to start a food truck business. Brandon will operate the business on a daily basis and believes his efforts are worth 70% of ownership. Therefore, when outlining the distributive share, Brandon believes he should be responsible for 70% of profits and losses. Savannah is then responsible for 30% of profits and losses since her involvement is solely administrative and much less time-intensive. As stated above, a multi-member LLC does not file or pay taxes as the LLC. Instead, the profit or losses will be the responsibility of each co-member in proportion to their distributive share. Schedule E: Partners report their individual share of profit or loss on their personal tax return. Form 1065: An information form for partnerships to report profits and losses, filed for the partners by the LLC. Schedule K-1: A document that details the profits and losses of an individual partner. Some states like California and Texas require LLCs to pay a special business tax. This tax is usually called a franchise tax, but can also be a "Business Excise Tax" or a "Privilege Tax." This tax can either act as a yearly fee with a flat amount, or it can be a percentage of the business like any other tax. For more on the troubles with small business bookkeeping and accounting, as well as some fixes, visit our guide.